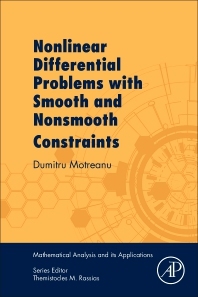 Nonlinear Differential Problems with Smooth and Nonsmooth Constraints systematically evaluates how to solve boundary value problems with smooth and nonsmooth constraints. Primarily covering nonlinear elliptic eigenvalue problems and quasilinear elliptic problems using techniques amalgamated from a range of sophisticated nonlinear analysis domains, the work is suitable for PhD and other early career researchers seeking solutions to nonlinear differential equations. Although an advanced work, the book is self-contained, requiring only graduate-level knowledge of functional analysis and topology. Whenever suitable, open problems are stated and partial solutions proposed. The work is accompanied by end-of-chapter problems and carefully curated references. Dumitru Motreanu is Professor of Mathematics at the University of Perpignan, France. Dr. Motreanu received the Ph.D. degree in 1978 from the University of Iasi, Romania. In 1991 he was a recipient of Simeon Stoilov Award from the Romanian Academy of Sciences. His areas of expertise cover partial differential equations and nonlinear analysis. He obtained original results in smooth and nonsmooth variational methods, nonlinear eigenvalue problems, multiple solutions for elliptic equations and systems. He coauthored 7 monographs in mathematics and published more than 190 professional articles in prestigious international journals of mathematics as well as more than 20 chapters in research volumes. He also edited a handbook of nonconvex analysis and three special issues of international journals. His results are cited and used in more than 1900 refereed papers. He serves in the editorial boards of more than 20 academic journals in mathematics.